It’s been a busy week with lots of decisions to make, but I’m pleased to say that they’re made and my dilemma has passed and I’m excitedly looking forward to the future. Although busy, I’ve been able to catch up with a few girlfriends before I start my new job and it’s been a real treat. Some were in lovely telephone conversations while others were face to face over a cuppa. As the week draws to a close and I look to the new week, I feel blessed to know so many lovely women and to hear their stories. Each one of them is facing their own challenges – jobs, family, personal or health. As mothers and wives we carry a lot of emotion and responsibility and feel we need to make things right for our families; running our homes, supporting our husbands while loving, nurturing and taking care of our young. To each of these friends, I salute you. You are all strong and blessed to have beautiful families and we live in a wonderful free country where we can work, our children can get a good education, our husbands are supportive and kind. In this day and age where so many couples have split and families are broken and forced to begin again under different and often difficult circumstances, I note that all these women work hard at making their relationships work. Many of their marriages are into the double figures and they understand that commitment isn’t about putting up with something until something better comes along. It is about learning when to compromise, when to take a stand, when to be gentle and kind and when to use that inner strength and roar. Great friends are hard to come by and I’m very grateful for mine. I shared a photo of this delicious tart on Facebook the other day and one special friend posted that she hoped it would be up on Chocolate Goose soon, so here goes. Hopefully you can make it and get to enjoy it with a few of your very closest and dearest girlfriends. 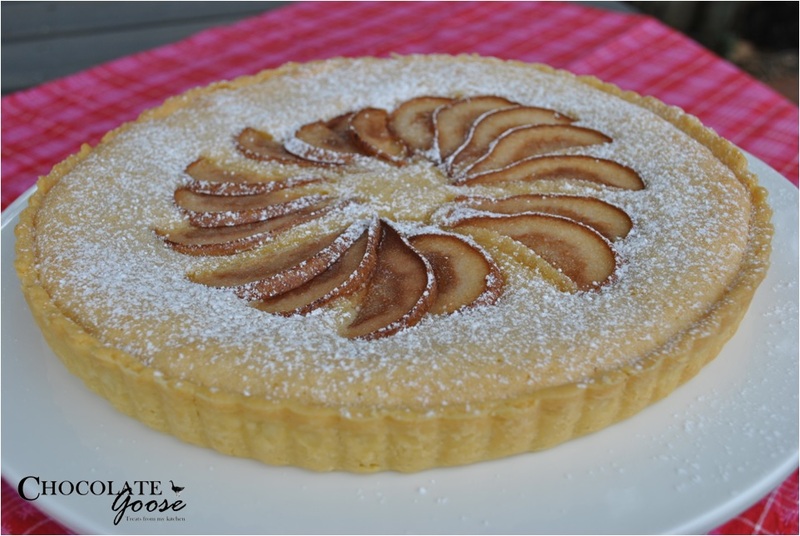 For those that aren’t sure what Frangipane is, it is a combination of ingredients that usually include ground almonds. It gives the texture a delicious crumbliness and softly enhances the flavour. This recipe can be made using store bought frozen pastry, or make your own. Also feel free to replace the pear with apple or use hazelnut meal instead of the almond meal. This is definitely NOT something you can serve to people with nut allergies. If you can’t find almond meal in the store, buy a bag of raw unsalted almonds and process them in your food processor until you have a fine flour, but note that it will be crumbly – it will not be as fine as other flours. Preheat the oven to 200ºC/180ºC fan forced. Lightly grease a 24cm (base diameter) round fluted tart pan with removable base (if you don’t have one of these, don’t stress, it’s just easier to remove the tart). Roll out the pastry if using home made, or simply line the pan with the thawed pastry. Trim the edges and place on a baking tray. Line pastry with baking paper and fill with baking weights, dried beans or rice. Bake for 5 minutes. Remove from the oven and remove the weights and paper. Return to the oven for 2 – 3 minutes more, I found that it wasn’t ready so left it in for 5 minutes, but it will depend on your oven so watch carefully as you don’t want the shell to brown too much…you want it to be a beautiful golden colour. Remove from the oven and reduce the oven temperature to 180ºC/160ºC fan forced. Using an electric mixer, beat the butter and sugar in a small bowl until light and creamy. Stir in the flour and almond meal. Spread the combined mixture evenly into the pastry shell. Arrange the sliced pear over the mixture and bake for 15 – 18 minutes or until firm. I baked for around 20 minutes, so again, pay close attention.